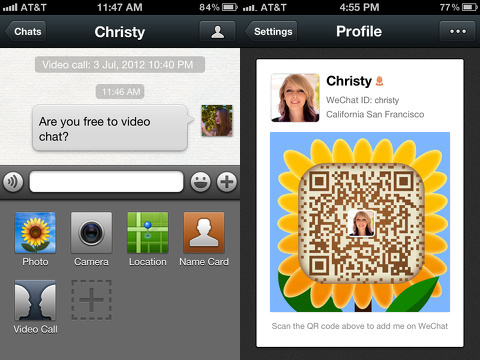 WeChat is a social network messaging app made by Tencent Inc. for the iPhone and iPod Touch. Its main feature is its walkie talkie style chatting. Basically, you hold down a button to record a voice messages which can be sent back and forth between friends. 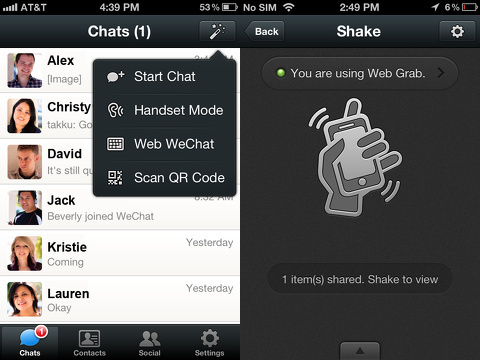 WeChat offers its services with speed and reliability. Messages are sent and uploaded in seconds, allowing you to have a full conversation with little delay. The recorded messages come out crisp, clean, and easy to hear. Simple enough, but WeChat is far more ambitious than just a messaging program, and offers some fun social networking features as well. Signing up and adding friends is incredibly easy with a number of different options. You can quickly sign up for an account from scratch or link accounts with your Facebook. Going the Facebook route has the nice perk of showing you all your friends who have also installed WeChat. If you’re standing close by to a friend you can shake phones together to swap info. You also have the option of sharing ID’s or scanning QR codes. Can you imagine if we had this app (or smart phones at all for that matter) when we were little kids? Playing cops vs. robbers, ninjas vs. pirates, Israel vs. Palestine, or whatever other binary opposition floats your boat could have really been taken to the next level with some sweet digital walkie-talkies. I can just imagine: “The cops are on our tail take cover!”, “Arrrr, these ninja naves keep deflecting me bullets!”, “They’re expanding their settlements, prepare retaliation!”. Ah, the innocence of youth. The ‘Social’ section of WeChat offers its own set of potential fun. There is a ‘Moments’ section, which is basically a photo album, and can be synced to Twitter. You can also ‘Look Around’ to search for people by gender and region. Lastly ‘Drift Bottle’ lets you send out a message to the deep blue sea of the internet and hopefully await a reply which would no doubt lead to new adventures, mishaps, and general tomfoolery. The success of social networking features are overwhelming dependent on the size of its user base, and WeChat doesn’t seem to be taking over the social networking scene anytime soon. Regardless, it has some cool features and is a solid chatting app, well worth it for the low, low price of zero dollars. AppSafari review of WeChat was written by Neema Akhtar on September 24th, 2012 and categorized under App Store, Chat, Social. Page viewed 9074 times, 2 so far today. Need help on using these apps? Please read the Help Page.